My girlfriend and I got our open water certification. The individual attention of Jesse, the great dive sites, and the ease with which everything was arranged, made this a perfect place to learn to dive. My husband Jeremy, our son Justin and I had 3 fabulous weeks with you. Your beach is spectacular and the diving and fishing with you (Jesse) and Roggie is exceptional…The diving was great. So much magnificent sea life. The turtles were fun, many sharks & pretty fish. Justin was particularly impressed with the inland blue holes and deep dives with Jesse and Chelsea. The variety of reef is special. Thank you for being warm and friendly. You (Jesse), Chelsea and Roggie all made our stay a pleasure and we hope to see you again. What an amazing vacation! My family recently enjoyed a beautiful and relaxing vacation in South Andros at the Andros Beach Club. The home has an awesome beach, practically four miles on which I never saw another soul! The beach was also an excellent place to watch the shining stars, which were stunningly bright. A long time diver, our hosts took us on some of the most impressive dive trips I have ever been on, from “blue holes” to shipwrecks to towering coral formations. They were able to accommodate the most experienced among us as well as my wife and mother-in-law who have not dove in over a decade. We were even taken to some thriving reefs to snorkel on with my young sister. If you like adventure as much as I do, you’ll love exploring the blue-holes and the amazing coral. You will not find anyone on the island with more expertise in the water than Jesse, Chelsea and Roggie. I have vacationed around the Caribbean, and Andros has the most beautiful fish and coral I’ve ever seen! I enjoyed the friendly, laid-back energy from everyone on the island. Thank you Jesse and Chelsea for being such wonderful hosts! © 2019 Andros Diving. Travel Website by RedstoneX. 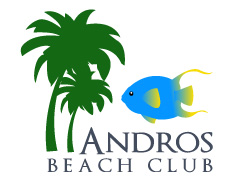 Andros Island Bahamas All inclusive dive vacation resort packages. Come dive with us!